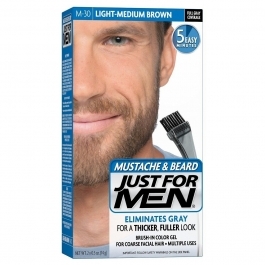 Just For Men Mustache & Beard hair color brings out the best in your facial hair. Facial hair looks fuller, more even and well-groomed as you get rid of the scraggly look of gray facial hairs. The fast and easy brush-in gel works in 5 minutes - your gray hair will be gone until it grows back. This ammonia-free formula is made specifically to penetrate and condition coarse facial hair. Just For Men Mustache and Beard hair color contains protein, Vitamin E, aloe and chamomile that nourishes your hair while you color. It leaves your facial hair looking well groomed, conditioned and thicker after every application. Its ammonia free formula causes no damage to your hair. Can't decide between two shades? Try the lighter one first. You can always go darker later. Made in the USA. Water, Coco-Glucoside, Aminomethyl Propanol, Carbomer, Fragrance, Resorcinol, Sodium Sulfite, P-Phenylenediamine, Erythorbic Acid, M-Aminophenol, Caramel, Trisodium EDTA, P-Aminophenol, N,N-Bis(2-Hydroxyethyl) -P- Phenylenediamine Sulfate, Cinnamidopropyltrimonium Chloride, Laurdimonium Hydroxypropyl Hydrolyzed Wheat Protein, Aloe Barbadensis Leaf Juice, Chamomilla Recutita (Matricaria) Flower Extract, Panthenol, Tocopheryl Acetate. Color Developer: Water, Cetyl Alcohol, Hydrogen Peroxide, Glyceryl Stearate, PEG-100 Stearate. Important: follow safety warnings on the side panel.Safety warnings.Haircolor products can cause allergic reactions which in rare cases can be severe. Temporary "black henna" tattoos may increase your risk of allergy. Do not use this or any other haircoloring product if you have experienced a reaction to a temporary "black henna" tattoo in the past. Before using this product, you must perform a preliminary 48-hour skin allergy patch (alert) test according to enclosed leaflet.Do not use this product if:You have already experienced any reaction to this or any other haircolor product.You have irritated, sensitive or damaged facial skin.Remember to perform the 48-hour skin allergy patch (alert) test before each use even if you have previously used this or other haircoloring products. For this reason, buy this product two days before you intend to use it.Read and follow directions on enclosed leaflet.In rare cases, use of hair dye has been associated with skin depigmentation (skin lightening or loss of skin color). which may be temporary or permanent. If you notice any skin depigmentation or other allergic reaction such as discomfort or severe itching, discontinue use immediately.Do not use this product at all if you have skin depigmentation problems such as white patches on your skin (a condition called vitiligo) or if you have a family history of skin depigmentation problems, as an allergic reaction may cause temporary or permanent loss of skin pigment.Caution:This product contains ingredients which may cause skin irritation on certain individuals and a preliminary 48-hour skin allergy patch (alert) test according to accompanying directions should be done first this product must not be used for dyeing the eyelashes or eyebrows-to do so may cause blindness.Keep product out of reach of children.Not for use on children.Haircolor can cause allergic reactions. Follow the safety warnings.Allergies to haircoloring products can develop over time, even though you had no reaction during previous usage. Conduct a skin allergy patch (alert) test 48 hours before each and every use.